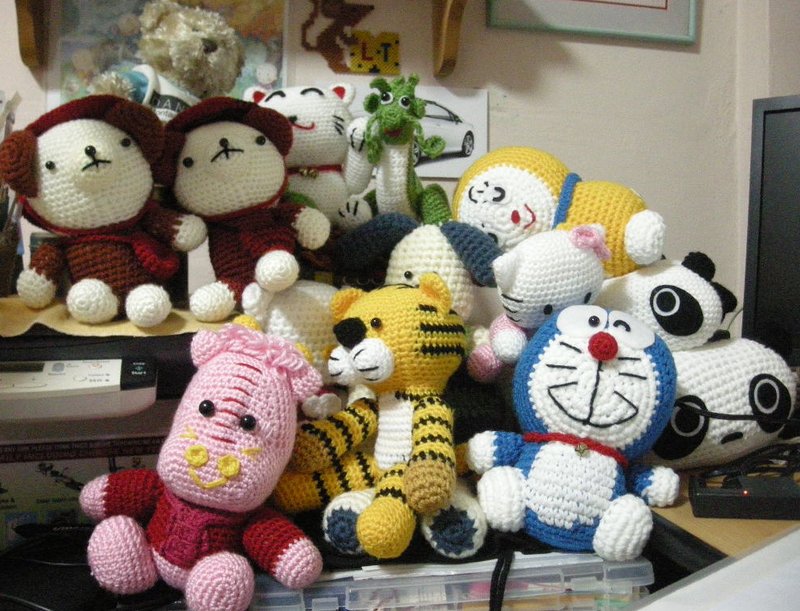 I have been doing a lot of crochet works lately. My latest unfinished projects include: a Japanese Cat doll, a dragon doll, a nylon string bag and a seat mat. My ‘going to start’ projects list includes: a Doremon doll, a Hello Kitty doll, a flowery floor mat. I wanted to write up for each of the projects I did in this blog and some hints and tips for who are interested to do crochet or currently doing. Lots of things on hand and I am speeding up right now. The picture show at the header banner of this blog was taken from the base of the nylon bag that I was currently doing. I like the pattern: a simple alternately between single crochet and double crochet forms a pretty unique pattern for the side of the handbag. I was delighted with the choice of the string I used that turns out with a bit of sparkling effect. Can’t wait to see the end product. I am still sourcing for the hairy yarn to finish up with the top and the handles. As mentioned previously, I have started crocheting since I was young. This hobby has all along accompanied me and became one of my best hobbies that I spent the most time with. What is so interesting about crocheting? Those who are extrovert would think crafting kind of hobby is boring. You spent all your time sitting down there dealing with entangling yarn. I am an active person too and yet I don’t find crocheting boring. So why is it so? How many times when come to Christmas season or other occasion that you are stuck with what to buy for a present to your families or friends? Or you could have a great favor to return to a deal friend and you find that it is not fare to just buy some commercial ready made stuff that does not show your sincerity. Make something unique! Learn what friends need and the next time when you come across some interesting crocheting project think of who is suitable to receive such unique gifts. Surprise your friends and family and at the same time show how thoughtful you are. How many times you wanted to start a new crochet project and found that you could not find the material you needed? You did not buy enough yarn to finish your project on hand and the yarn was all out of stock? You panic and scratching your head wondering what to do next? Most people when dealing with such situation would just give up and wasted the effort they have done so far on the crocheted project. As for me after years of crocheting, I have master the principle of not giving up hope on any uncompleted projects. I once did a crocheted blouse with single crochet on back loops all the way, only to find out at the last stage that I did a wrong estimate and the blouse turn out to be too short. Instead of redoing the whole blouse, I did a separate crocheting piece and join to the bottom of the existing blouse. In order to cover the joints which turn out to be pretty obvious with holes in between, I bought a ribbon of similar color and run it round the holes to cover it. It turns out to be another new design for the blouse. So always exercise think out of the box to save projects from failing. you will never know how great your creativity could be unless you try out. There are times that when you read a very interesting crochet project that you wanted so much to make it, you could not understand how to make a certain part. You read the book, do some research on it and still could not figure out what is all about. You are frustrated as your project only left this last part of puzzle to resolve. I have encountered many times on this, what I did was leave the problem aside. A few days later I will come back to the problem again with a refresh mind and I could see the problem in a different angle. Try a few more times until if finally works. Never give up on anything that hinder your progress with a never say die attitude. How many times when you will doing crochet half way and the yarn got entangle? I admitted that I am not the type who loves to disentangle yarn. Although some of my friends do love it. There are times that you have to repeat the same pattern and keep crocheting until it reaches its required length, especially when you are doing big projects like a sweater or an afghan. Just like growing a plant, you need a lot of patient and care to the project that you are doing in order to make a good product. There will be times that you need to restart all over again due to wrong doing (too short or too long or too ugly or whatever). Crochet makes me learn to be patient and consistent with my hard work. One day I would see my beautiful unique product born into this world! You wanted to learn new things and understand what problems the others like you may encountered? Signup some of the crochet forum, meet up with a few friends who share the same interest and crochet together once a week. You will be surprised how much you could learn from each other. When you invited your friends or relatives to your house, remember to show off a bit of your products displayed at home. It helps to create a unique environment to live in and at the same time be proud of it when being praised. I have all my products” crocheted window curtain, table runner, coaster, all decorated at different corners of my house. You would feel good and you could easily enter a conversation with whoever visited your house. Having stated so much goodness for crocheting, aren’t you getting ready to learn this wonderful hobby? Or do you have some unfinished project hidden some place? Quickly take them out and continue doing. Action makes the world go round!